Last week a group came with a special request for a workshop with a fishy focus. This is the one where we go the day before to the fish counter of the local supermarket, armed with an inventory/list of loads of different seafood (names in English, French and German to cover all local eventualities), so as to get a feel for what’s on offer, what it looks like, what its name is in F or G and how to deal with it/cook it. It’s one of my favourites – love the idea of getting even those who are a bit nervous about fish to a) buy, b) cook and c) taste something new and unfamiliar. We bought some tiny (‘queen’) scallops and red mullet fillets which we tossed over some salad and rucola leaves – the red mullet, which has quite a pronounced taste, got a mixed reception but the scallops went down well, sweet and succulent and good with a mildly orangey dressing. 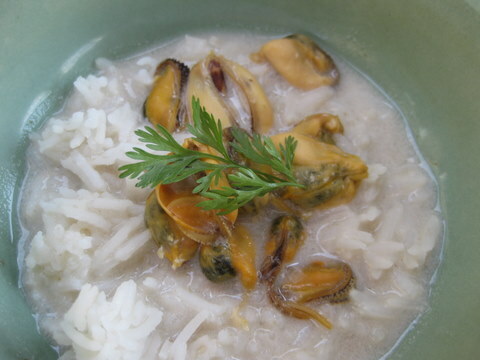 Mussels got the shock treatment, steamed open over ginger/lime leaves/lime zest/garlic, shelled, their juices mixed with coconut milk and the whole thing spooned over Basmati rice, above (gorgeous over black rice too: orange moules, black rice, coriander leaves…). We also did that great standby, saumon à l’unilatérale, salmon minimally cooked on a bed of sea salt in a pan, one side only, which we did with a fennel salsa. And finally a whole fish on the bone – in this case a beautiful pagre (bream family) – which we baked in the oven and served with a coriander/cilantro cream sauce. You’ll find most of the recipes in the Fish & Shellfish section here; have a hunt around and see what you can find. 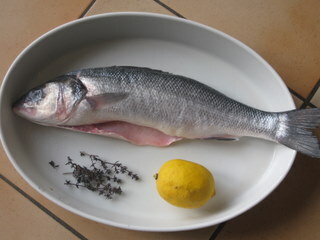 Then take off on your own exploration of the local fish counter/market, cook up some lovely seafood and have fun.. Previous: Previous post: Is there such a thing as affordable Burgundy?